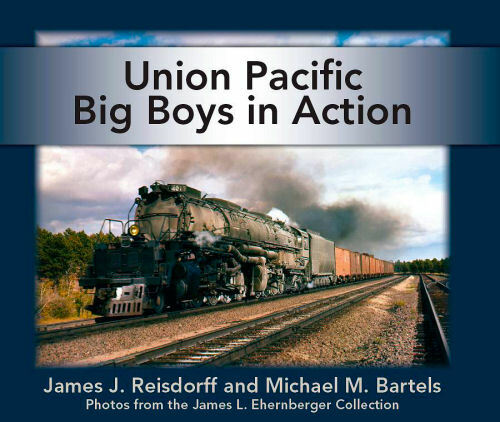 Union Pacific Big Boys in Action - Introductory Offer!! "Big Boy," the world's largest steam locomotive, is in the news as Union Pacific Railroad plans to restore one of these behemoths to operative condition. In anticipation of the event, this book covers the engine class between 1941 and 1959, when Big Boys were in regular service in Utah and Wyoming. Coverage is mainly given to those eight Big Boys now preserved at museums and municipalities across the U.S. This pictorial examines how Big Boys were extensively documented by both professional and amateur railroad photographers who came to the Wasatch Mountains and Sherman Hill to see big UP steam before it was "too late." The book shows some of the best action photography taken of Big Boy as provided from the collection of UP rail historian James L. Ehernberger. Also included is information about the photographers, critiques of their images and a descriptive year-by-year time line of Big Boy operations. Soft cover.